OnePlus CEO Pete Lau is going to reveal something big related to its upcoming product launch. Will it be OnePlus 7 or OnePlus TV, find out here. There has been a generous flow of rumours and leaks about one of the most anticipated flagships of 2019, the OnePlus 7, but there has been nothing from the official channels. While the world eagerly waits for the major reveal next month, the company's CEO decided to build some more hype for the upcoming flagship. While the OnePlus 7 launch date has reportedly been finalised and the event could take place on May 14, the leaked information is not certain until there's an official word. Looks like we won't have to wait long. OnePlus CEO Pete Lau acknowledged the hype around the upcoming OnePlus device and suggested that more information about the new device will be shared on Wednesday, April 17. Lau doesn't specifically mention OnePlus 7, but all hints point towards the new "flagship killer." Will Lau reveal the official launch date of OnePlus 7 or give a peek at the phone's design or give away a major feature that will build more hype. Guess we just have to wait and watch. On the off chance Lau doesn't reveal anything related to OnePlus 7, some theories also suggest there could be something around the OnePlus TV. The company chief briefly addressed the topic during his address at the European Institute of Design in Milan last week. In both cases, OnePlus fans are in for a treat as OnePlus gears up for some of the biggest launches since its inception five years ago. 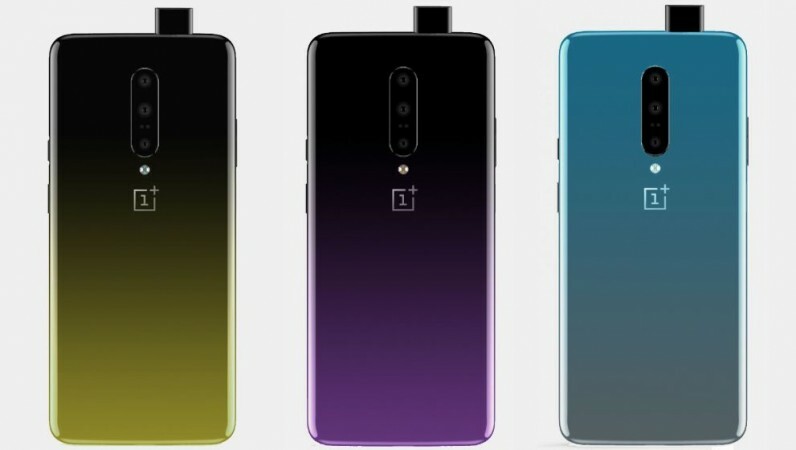 Courtesy of series of leaks, OnePlus 7 has been one of the most leaked handsets. As a result, anticipating fans get an early look at the phone – regardless of the leak's authenticity – to ease their restlessness. Based on what we've heard so far, OnePlus will launch three variants this year – OnePlus 7, OnePlus 7 Pro and OnePlus 7 Pro 5G. The OnePlus 7 will be slightly different from the Pro variants, which will be targeted towards the premium category. OnePlus 7 is expected to ditch the notch in favour of a pop-up selfie camera to accommodate a truly full screen display with Full HD+ resolution. There are going to be three cameras at the back of the phone, combining 48MP + 20MP + 5MP sensors and a 16MP front-facing camera. Under the hood, fans can expect a Qualcomm Snapdragon 855 chipset with at least 8GB RAM and 128GB storage. In the case of OnePlus 7 Pro models, the RAM configuration could reach as high as 12GB, and the display will be curved on the sides to further enhance the viewing experience. The 5G variant's support the latest 5G band is naturally understood. OnePlus TV hasn't been the buzz maker like the OnePlus 7, but it has generated quite an interest. When Lau talked about the upcoming smart TV last week, he suggested that OnePlus TV will be the upgrade the industry hasn't seen in over 20 years.